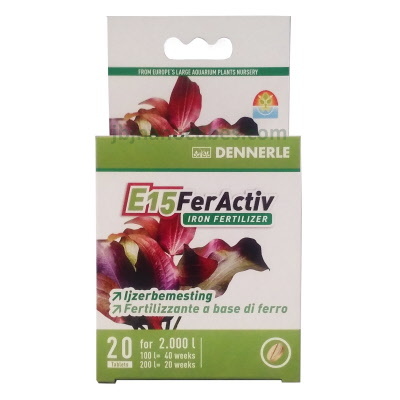 E15 FerActiv iron fertilizer ensures that plants will stay a beautiful, fresh green color by providing divalent iron that aquatic plants can use immediately. Symptoms of iron deficiency such as yellow, glassy leaves are almost completely cured, while young leaves will once again show a rich, green color. Iron is required for all plants for producing chlorophyll. A plant is unable to photosynthesize without it. Please note: plants are able to absorb only divalent "white" iron. Unfortunately, “white” iron is unstable in an aquatic system, and is rapidly oxidized to become useless trivalent “brown” iron. Tap water is virtually without iron. Therefore, regular iron fertilization is essential for aquarium plants.